Why do so many masterpieces end with variations? On the face of it, variation form is static, with its continual covering of the same trace. Richard Mühlfeld, the clarinettist who inspired Brahms’s Quintet and to whom it was dedicated in 1891, could well have wondered if a variation-finale would be designed to show off his skill in decorative virtuosity. Knowing his Brahms, however, and knowing the Mozart Quintet, he could not have entertained this ‘hope’ for long. The static nature of variation can, of course, generate very deliberate, large motion—the grand procession from one variation to another, or from one group to another, to create an edifice dramatically striking in itself, rather than developing the internal active drama of sonata movement. In a work where the earlier movements display sonata-type activity, an antithesis of this kind may in some circumstances help to canalize all the previous energies. Variations are more likely to succeed in this than, say, fugue, which is argumentatively static and therefore not easily made apt to a process hitherto based on muscular dramatic action; a fugue may very well serve to expand on the slow momentum generated by a set of variations (as towards the end of the ‘Diabelli’ Variations) or it may wonderfully create a plane of contemplative thought from which action is to grow (as in Beethoven’s C sharp minor Quartet), but its appearance following a long period of dramatic activity will, unless a drastic stroke of genius is invoked (as in Beethoven’s late B flat Quartet, Op 130, with its original finale, the Grosse Fuge), likely produce an unfortunate situation as if the builders of a house had suddenly ceased work to argue the point. With variations as finale we get the sense that these builders have almost finished the structure and are moving around it in a series of viewpoints (offered by a number of variations on a theme) so as to know how to complete the work. Variations may begin the whole work on a quiet plane, or they may provide a period of repose among more active elements. As finale, a set of variations is liable to be pressed into a wider variety of uses. Essentially it may be a high plateau, reached after a climb or a variegated journey; or we might at length find ourselves strolling in gentle country after breathless adventures; or we may in the end be staring at something at once active and static, fulminating majestically like a volcano or the finale of Brahms’s fourth symphony. In all such cases, calm or blazing, the variation-finale is a last steadying or canalizing of the work’s energies. 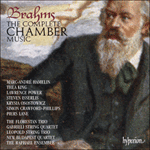 In Brahms’s Clarinet Quintet the variation-finale distils the substances of the elegiac work in various ways, and we end with the impression of something ineradicable. When the first movement theme comes back at the end, a circle seems to have been completed. The broad, spacious, richly eventful first movement is Brahms’s last very large sonata structure; the remaining two that followed (the clarinet sonatas, also for Mühlfeld) are on a smaller scale, and Brahms thereafter concentrated on small forms of great density. 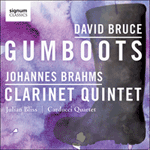 In this nobly expansive quintet the clarinet is nowhere treated as a soloist, except where its sound is essential to the aural canvas; this is a real quintet throughout. 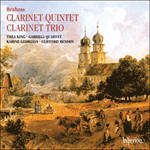 The principle of equality applies in all the movements, and the only place where the clarinet is given free rein is in the centre of the otherwise rapt Adagio, where the intense ruminative beauty is abruptly broken into by wildly evocative clarinet flourishes reminiscent of the gipsy music Brahms loved so much. The underlying melancholy of much of the Quintet is relieved by the gentle third movement, where contrasting tempi are merged or superimposed in a way recalling the corresponding movement in the second symphony. Its quiet close sensitively makes way in mood (and rhythm) for the theme of the great variation-finale.